Incredibles 2 (film) Animated feature from Pixar Animation Studios. 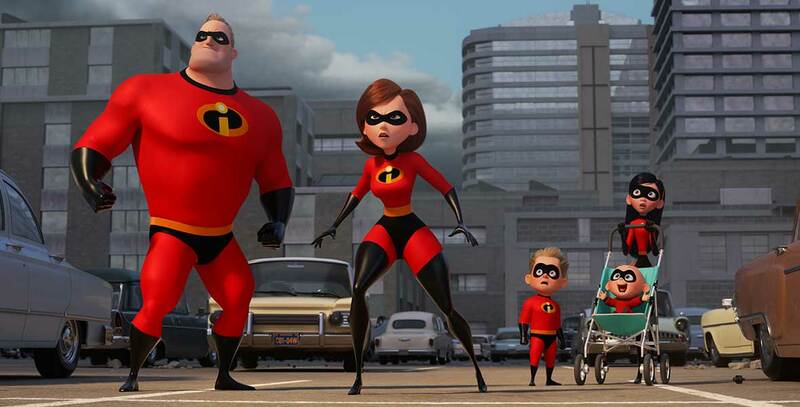 The Incredibles, a family of supers, is back. Helen leaves Bob at home with Violet and Dash to navigate the day-to-day heroics of “normal” life while she is out saving the world. It is a tough transition for everyone, made tougher by the fact that the family is still unaware of baby Jack-Jack’s emerging superpowers. When a new villain hatches a brilliant and dangerous plot, the family and Frozone must find a way to work together again—which is easier said than done. Directed by Brad Bird. Released, also in 3D and Imax, on June 15, 2018, after a June 13 release in the Philippines. Voices include Holly Hunter (Helen Parr/Elastigirl), Craig T. Nelson (Bob Parr/Mr. Incredible), Sarah Vowell (Violet Parr), Brad Bird (Edna Mode), Samuel L. Jackson (Lucius Best/Frozone), Huck Milner (Dash), and John Ratzenberger (The Underminer). Running time: 118 min.